Open 3 weekends 11am-5pmIf you would like to be added to my email list please contact me. 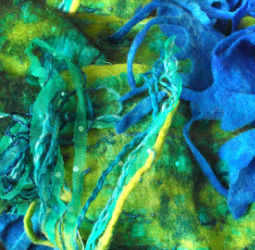 Description: This is an opportunity to learn or improve your felt making skills on a one-to-one basis. You will have my individual attention and access to all my equipment and materials. The day can be taylor made to what ever project or projects you would like to do or improve upon. Lunch will be provided and tea, coffee, cake and biscuits will be on tap at all times. Could be the perfect special present for that 'crafty' friend or relative! I can send you a personalised gift voucher if you wish. Description: This day is for two friends sharing. Have fun, learn a new skill or improve on an existing one, in a friendly, relaxed environment. You will have my individual attention and access to all my equipment and materials. The day can be taylor made to what ever project or projects you would both like to do or improve upon. Lunch will be provided and tea, coffee, cake and biscuits will be on tap at all times. Could be the perfect special present for that 'crafty' friend or relative! I can send you a personalised gift voucher if you wish. Description: We will be looking at lots of examples of eco printing, and all the different leaves and flowers we can use to make a print.. You will be taught the procees and learn how this strange alcamey shifts and changes to create it's magic. You'll spend time making lots of samples on different fabrics and papers and experimenting with different vegetation. In the afternoon you have the opportunity to make your very own unique eco print silk scarf, as a reminder of the day. Lunch will be provided and tea, coffee, cake and biscuits will be on tap at all times. Date: Eco printing is seasonal. June-September. This is because the tannin needs time to build up in the leaves at the beginning of the year, and harvested before they start to fall in the Autumn.